When I want to know anything about the wine and food of Naples and Campania, I ask Maurizio de Rosa. I am not the only one to take advantage of his knowledge. Mr. de Rosa was born in Naples and his mother still lives there. Marurizio is now the export manager for Feudi di San Gregorio one of the leading producers in the region. 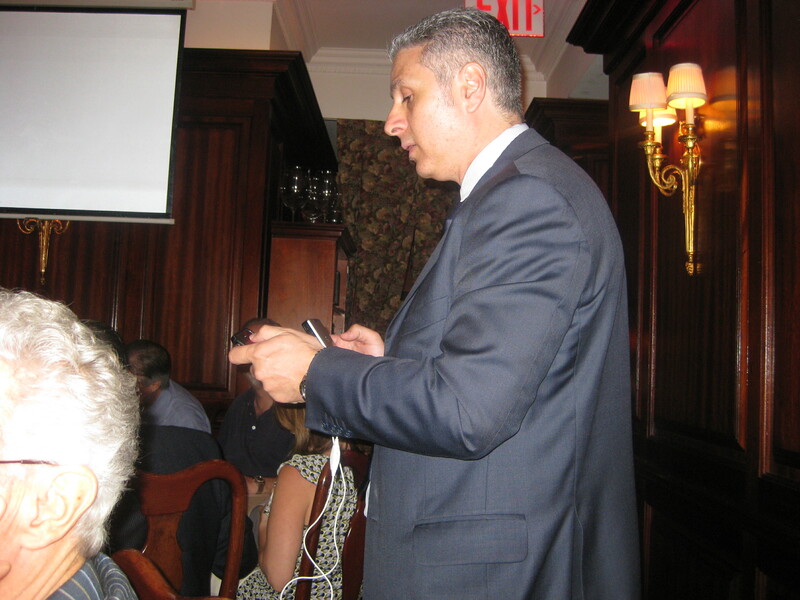 I asked Maurizio, who is writing a book on Taurasi wines which will be out at the end of the year, to be the guest speaker at a tasting and lunch featuring Taurasi for the Wine Media Guild at Felidia Restaurant. He agreed and said he would supply the wines and group the producers according to the vineyards where they sourced their grapes because, just like the crus in Barolo, different vineyards give a different character to the wine. There were 19 wines from 19 different producers. There are many great red grape varieties in Italy but three seem to stand out above the rest. They are Nebbiolo, Sangiovese and Aglianico. Aglianico finds its greatest expression in Taurasi in Campania and Aglianico del Vulture in Basilicata. In fact Taurasi is produced less than 40 miles from Aglianico del Vulture. Aglianico was brought to Southern Italy by the Greeks and many believe that its name comes from “Hellenico”. Jeremy Parzen has an excellent article “Aglianico does not equal Ellenico” at www.dobianchi.com and Mr. de Rosa seemed to agree with his interpretation. Mr. De Rosa said the Aglianico grape thrives in vineyards of very high altitudes of 400 to 500 meters above sea level. 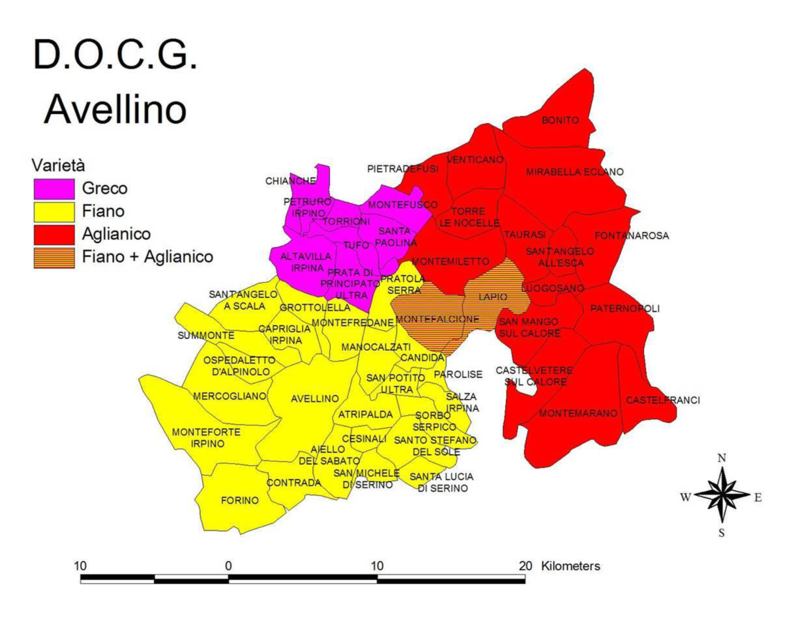 The vineyards for Taurasi are located in the Province of Avellino. Total area is about 750 hectares of volcanic soil. He went on to say that the volcanic soil of the Taurasi region demonstrates the potential of the Aglianico grape as one of the best in Italy. Taurasi was awarded the DOC in 1970 and the DOCG in 1993. Taurasi must be aged for at least three years before it is released, with at least one year in wood. The Riserva must be aged at least four years. It must be at least 85% Aglianico and 15% of Piedirosso, Barbera and Sangiovese can be blended in. In my opinion the best is made from 100% Taurasi but I do not mind a little piedirosso being added. 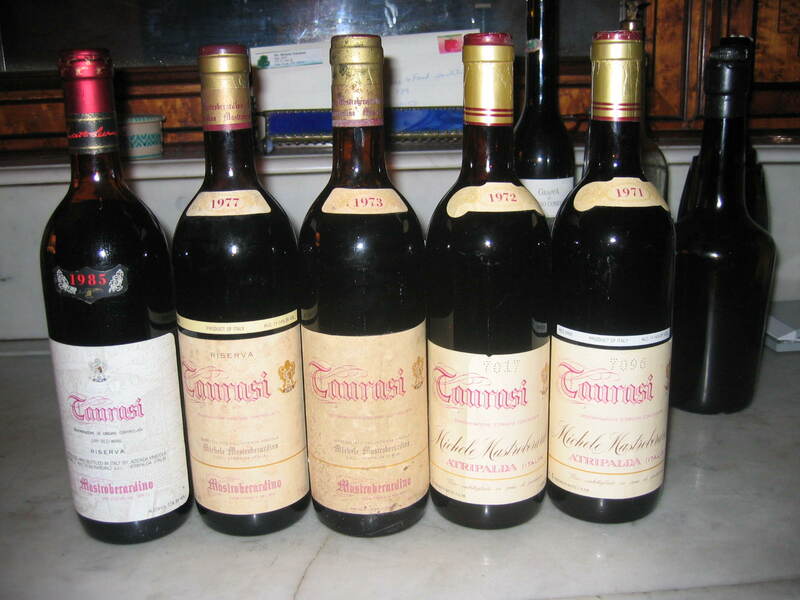 The five-star vintages of Taurasi that can still be found are: 1968,1977,1985,1987,1988,1990, 1993,1997,1999, 2001 and 2004. For many years only Mastroberardino was producing wine for the export market. Taurasi really did not become popular in the U.S. until the 1990’s. More wineries opened in the zone and began to export Taurasi into the U.S. Today there are over 293 producers in the Taurasi zone but still very few import their wines into the U.S. I have been drinking Taurasi from Mastroberardino for over 30 years. At one time these wines were undervalued and could be brought at auction for very little. Even a case of the legendary 1968 could be purchased for a few hundred dollars. Today the older wines have become very expensive. With the 2001 vintage, Mastroberadino went to the “dark side” with the use of barriques. I have tasted almost all the vintages produced by Mastroberadino from 1968 to 1999 and consider them some of the finest wines produced not only in Italy, but in the world. My favorite wines overall at the tasting came from producers that obtained grapes from vineyards in Castelnetere Sul Calore, Paternopoli, Castelfranco and Monteramarano. Maurizio said that most of the vineyards in this area were over 500 meters and it was the most homogeneous so that the terroir was very important. Except for the Montemarano area which had a less southern exposure. There is clay soil here rich in piroplastiti. The grapes ripen later here and the harvest usually takes place in mid-November. The higher the altitude the more complex the wine and he pointed out that the grapes here are more vibrant with higher tannic expressions. I liked all five of the wines from this zone but the Perillo and Molettieri were really outstanding. Castello dei Monaci “Monaco Rosso” 2003 ( Monteramarano) $? These grapes from the vineyard from Pietradefusi,Torre Le Nocelle, Venticano, Montemietto and Montefalcione were at elevations of 300-500 meters. The soil has a clay component and co-exists with marly limestone layers in lose layers. More extreme hydrostress. The harvest here is early and is normally completed by the middle of October. I liked four wines from this zone. Cantina Crogliano “Santo Stefano” 2002 (Montefalcione) $? Producers harvesting from vineyards in Mirabella Eclano, Fontanarosa, Sant’Angelo All’Esca and Taurasi. The vineyards are 350-500 meters from Mirabella Eclano to Fontanarosa respectively. It is a more diversified zone. The soil here is clay with layers of limestone and sand but there is a difference in the various terroir and therefore the style of the producer is more important in this zone. Lonardo “Contrade di Taurasi” 2001 (Taurasi) $70, this is a big wine and my favorite of the tasting. 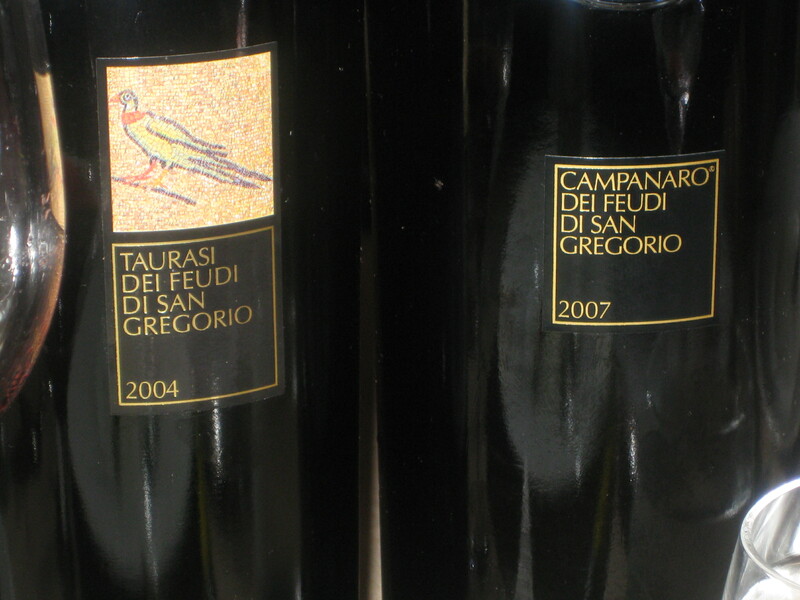 When we sat down to lunch besides drinking what was left of the Taurasi, we had the Feudi San Gregorio “Campanaro” 2007. It is mostly Fiano di Avellino with a small amount of Greco di Tufo $ 45. It went very well with the first course. Mr. de Rosa, with the use of slides and his vast knowledge of the Aglianico grape and of Taurasi in particular, gave a truly interesting and informative presentation. Another excellent post and very nice of you to praise Maurizio. I spent time with his brother Bruno in Napoli in June – he is a very nice man as well. It was nice to see you rate the Lonardo “Contrade de Taurasi” as your favorite. I had recommended this wine before, and as it is a traditional style, I knew you would love it. I visited the estate and tastes the wines with the owner Sandro. He is an excellent farmer and winemaker. The 2005 is the current vintage and it is a beautiful wine. I hope you meet with him on your next trip. Ciao Tom- Yes I saw Bruno in Naples last time I was there and I went to his Mother’s home for dinner- it was very special. I have a bottle of the Lonardo 2000 that Bruno gave me. Thnx for the post. I found a lot of valuable info here. I’m a fan of Anglianica and spend some time every year mostly in Revello. Hiking down from the town through the terraced vineyards is a yearly pleasure. I would quibble with any list of Italian wines that exclude Frappato or at least Nero D’Avola from Sicily. Wine making, especially organic wine from the Etna region from Occhipinti, Cos and others is changing the world’s view of Italian wine. Ciao Arnold- I go often to the the Amalfi area my self. I drink a lot of Frappato and Nero ‘ Avola. I received a bottle of Mastroberandino Taurasi Wine 1968 Montemarano No. 2085 as a gift. I am wondering what it’s value is. Thank you.